Subclavius muscle is a relatively minor muscle located deep within the chest. Subcalvius is a thoracoappendicular muscle; origin, first costal cartilage; insertion, inferior surface of acromial end of clavicle; action, fixes clavicle or elevates first rib; nerve supply, subclavian from brachial plexus. Along with the pectoralis major and pectoralis minor muscles, the subclavius muscle makes up the anterior wall of the axilla. Subclavius muscle is located under (sub) the clavicle (clavius), which is also known as the collarbone. If we find the inner part of our collarbone with our fingers, then move our fingers to just under the collarbone that is roughly the location of the subclavius muscle. Subcalvius muscle originates at the first rib (border between the bone and cartilage) and inserts at the lower surface of the lateral clavicle. Thereby it lies behind the pectoralis major. The brachial plexus and both the subclavian artery and vein pass under the subclavius muscle. Due to its location and relatively small size the muscle is hardly palpable. The innervation is carried by the subclavian nerve, a branch of the brachial plexus. 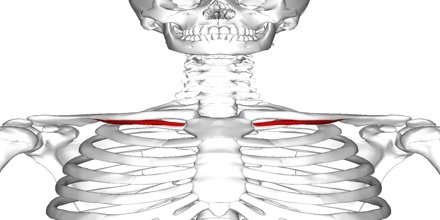 Subclavius muscle originates from the first rib. Specifically, this muscle begins in the area between the bone and the cartilage of the first rib. 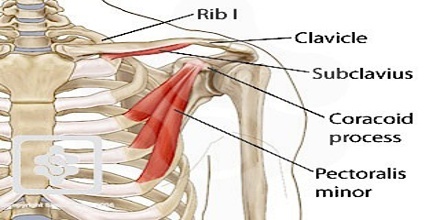 The human body has two of these muscles, each inserting into the inferior of the clavicle bone (collarbone). The muscles attach to each of the first ribs via costal cartilage – a fibrous, connective tissue high in collagen. During breathing, the costal cartilage allows the chest to expand and contract freely. 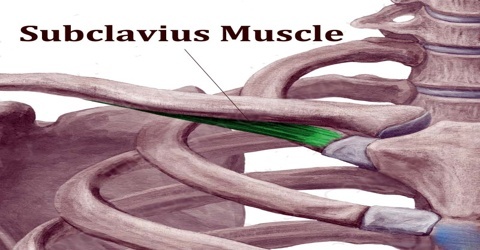 The nerve to subclavius (or subclavian nerve), which arises from the point of junction of the fifth and sixth cervical nerves, where is called the upper trunk of brachial plexus, innervates the muscle. The brachial plexus is a collection of nerves made up of the bottom four cervical nerves (C5-C8) and the top/first thoracic nerve (T1). The cervical nerves are eight pairs of nerves that emerge from the seven cervical vertebrae of the spinal cord, which are located below the skull. Under these vertebrae are the thoracic vertebrae, which attach to the ribs. The thoracic nerves emerge from these vertebrae. The nerves of the brachial plexus that stimulate the subclavius muscle are the C5 and C6 nerves; also know as cervical nerve V and cervical nerve VI. The main task of the subclavius muscle is the active stabilization of the clavicle in the sternoclavicular joint during movements of the shoulder and arm. Furthermore its contraction leads to a depression of the clavicle and elevation of the first rib respectively. These movements however play a rather subordinate role. The subclavius depresses the shoulder, carrying it downward and forward. It draws the clavicle inferiorly as well as anteriorly. Reference: healthline.com, study.com, kenhub.com, wikipedia.